Raising the share of income saved is a frequent aim of public policy. That may be particularly apparent in debates about the size of the federal budget deficit, but concerns about the low household saving rate have also prompted policymakers to consider ways to encourage individuals to save more. How much individuals save will directly affect their future economic well-being. 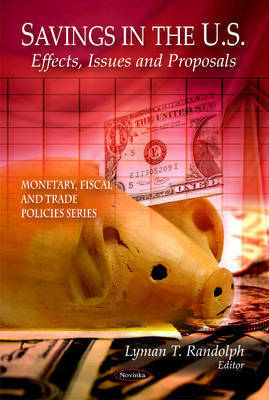 This book presents standard economic analysis of the macroeconomic effects of raising savings. An increase in saving means a reduction in spending. In the short run, that is likely to result in slower economic growth than would otherwise have been the case. When the saving rate rises, demand for financial assets rises as well. This book also looks at savings incentives and Social Security, and why the household savings rate is low. From a macroeconomic perspective, what matters is that saving, whether from the household, business or public sector is channelled into investments which increase the capital stock, raise productivity and add to economic growth. This book consists of public documents which have been located, gathered, combined, reformatted, and enhanced with a subject index, selectively edited and bound to provide easy access.